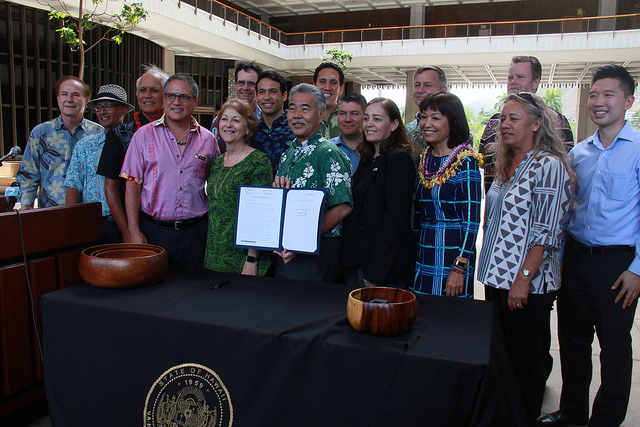 On Tuesday, July 3, 2018, Hawaii Governor David Ige made history by signing Senate Bill 2571 (now Act 104) into law, becoming the first state in the U.S. to ban the sale and distribution of sunscreens containing oxybenzone and octinoxate chemicals without a prescription issued by a licensed healthcare provider. The historic bill was introduced to the Senate on January 19, 2018 by Hawaii Senator Mike Gabbard and will be in effect on January 1, 2021. Photo courtesy Office of the Governor. In 2016, Maui Ocean Center committed to educating the public and guests about the dangers of sunscreen pollution. We stopped selling chemical sunscreens in our gift store, created infographics and blogs, testified in support of a Maui county-level ban, hosted Dr. Craig Downs (leading researcher into the effects of sunscreen on coral health) for a Sea Talk, and sent a representative to speak at the Toxic Sunscreen Rally held at the State Capitol building. Elyssa Farmer, Head Naturalist (right) with Senator Will Espero (left). Did Hawaii Really Ban All Sunscreens? No, this law only affects sunscreens containing oxybenzone and octinoxate, both of which are harmful to corals. Sunscreen products that omit these chemicals are still available to purchase. How Are These Chemicals Bad for Corals? 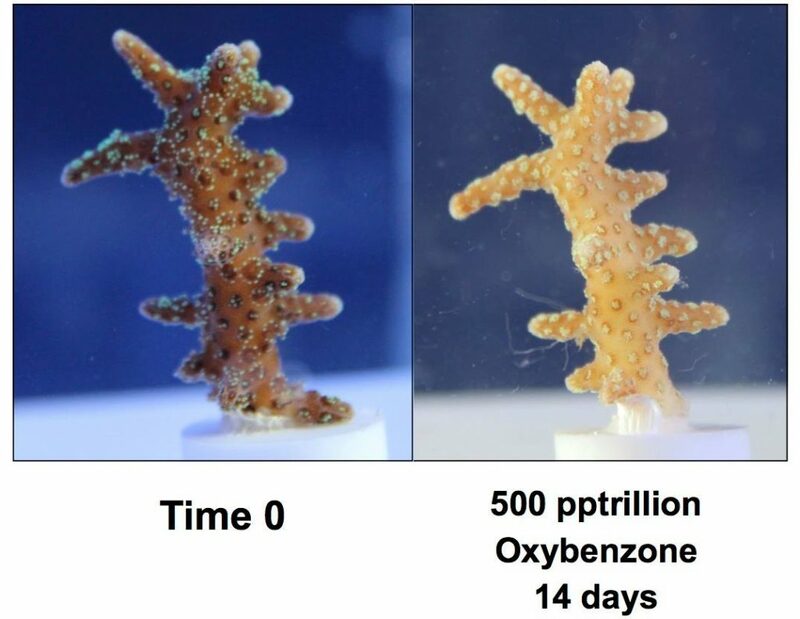 Oxybenzone disrupts a coral’s ability to develop and reproduce. According to Dr. Craig Downs, Ph.D., forensic ecotoxicologist of Haereticus Environmental Laboratory, oxybenzone “induces coral bleaching by lowering the temperature at which corals will bleach when exposed to prolong heat stress.” He explains that oxybenzone is a genotoxic that damages a coral’s DNA, which can lead to deformities, and disrupts coral larvae development by acting as an endocrine disruptor. Oxybenzone has also been found to be toxic to algae, sea urchins, fish, mammals, and even humans. Watch Dr. Downs’s Sea Talk to learn more. With Millions of Beach Users, How Will Hawaii Enforce This Ban? SB2571 eliminates the sale of such sunscreens at the retail level, thus vastly reducing the availability of chemical sunscreens. Yet another misconception, Hawaii law enforcement will not police the beaches to check or confiscate your sunscreen. Why Wait Until 2021 If Our Corals Need Help Now? The next few years serve as a transitional period to allow sunscreen manufacturers and retail stores ample time to make necessary adjustments including formula revisions. This law affects over 3,500 sunscreen products. What About Skin Health Concerns? 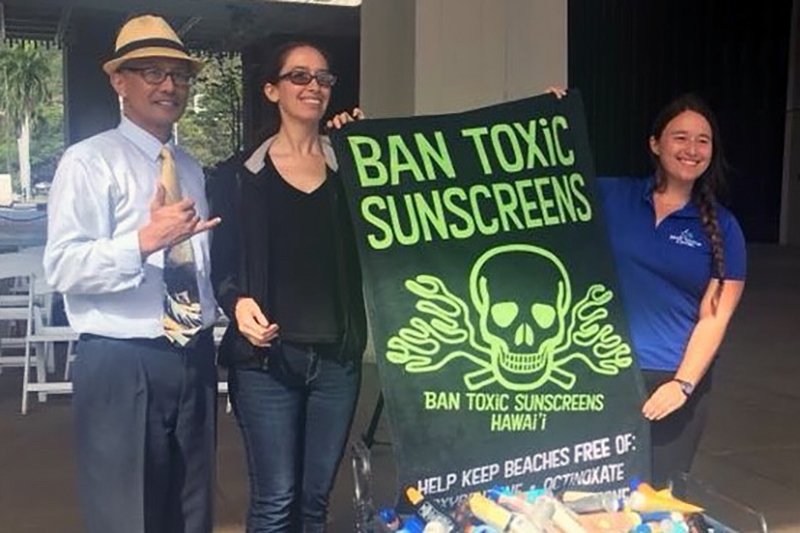 Maui Ocean Center and the supporters of SB2571 recognize that skin care is a vital public health concern. To ensure people at-risk of harmful UV rays are still protected, the law does offer an exemption to those who secure a prescription from their licensed healthcare provider. There are other alternatives to chemical sunscreens including UV protective clothing, mineral-based sunscreens, avoiding peak daylight hours, and more. Learn more about sunscreen alternatives. What Does This Mean for Hawaii’s Coral Reefs? This means we’re giving corals a fighting chance to recover over time. We are excited and anxious to see how coral reefs respond in the coming years. It’s important to recognize that there are many threats to Hawaii’s corals, and a complex issue requires multiple solutions. The passing of SB2571 is one of these solutions and a glowing example of how collaboration between public, private, scientific, and government organizations can result in a large-scale change to protect our natural resources.